Despite the enormous amount of information that has been accumulated about fossil lycopods, there are still gaps in our understanding of their evolution. During the Carboniferous in Euramerica the lycopsids were well represented by at least four major orders. These included the large arborescent forms (Lepidodendrales) (e.g., Diaphorodendron, Lepidodendron, and Lepidophloios) with stigmarian rooting structures; the smaller woody types (Isoetales) (e.g., Chaloneria) with cor-mose rooting organs; and the herbaceous, ligulate or eligulate taxa included in the Selaginellales and Lycopodiales, respectively. 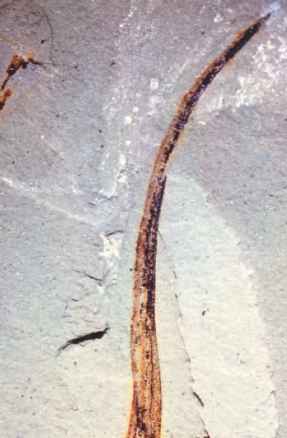 It is becoming increasingly clear that there were other Carboniferous lycopsids, such as Hizemodendron serratum, that were pseudoherbaceous, but produced mono-sporangiate cones like those of the Lepidodendrales, suggesting that perhaps this type of morphology evolved via reduction of the arborescent habit (Bateman and DiMichele, 1991). Historically, many comparative morphologists and paleo-botanists believed that the fossil record, although admittedly incomplete, provided sufficient evidence to suggest that Isoetes represented the end of a transformational series beginning in the Carboniferous. According to this idea, the extant plant Isoetes represented a Flemingites-type cone seated on a stunted, stigmarian base (Stewart, 1947). Proponents of this concept, called the "lycopsid reduction series" (originally "-ycopod"- , suggested that a sparsely branched, heter-osporous lycopsid like Sigillaria was the starting point of the series (Potonié, 1894). With a reduction in the number of aerial branches, a contraction of the branched, stigmarian rooting system to a cormlike base, and a reduction in the overall size of the plant, a plant like the Triassic Pleuromeia (FIG. 9.124) might represent an intermediate stage. Continued reduction of the main axis would produce a plant similar to Nathorstiana and eventually, Isoetes. 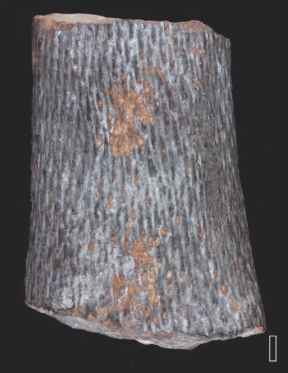 The discovery of Carboniferous lycopsids with cormlike bases, such as Chaloneria , suggests that the cormlike lycopsids did not evolve from the arborescent forms by reduction, but existed at the same time. Additional specimens of rooting organs from which developmental data can be inferred, together with information on developmental stages of the embryos of two permineralized taxa, also support the idea that the lycopsid reduction series is too simple an explanation of the complexity and diversity of the fossil lycopsids. system that is fundamentally unlike the primary root system in seed plants. These authors suggested that the branched, stigmarian system is the most primitive type of lycopsid rhizomorph, and that the rooting structures of plants that we have included within the Lepidodendrales, Isoetales, and Pleuromeiales are all homologous. Rhizomorph development in Selaginellites (=Paurodendron) fraipontii, currently considered to be a member of the Selaginellales, is thus interpreted as being similar to that in Isoetes (Rothwell and Erwin, 1985). One fundamental difference between the Selaginellales and Lycopodiales and the other lycopsids concerns the nature of their rooting structures. Plants in these two orders are characterized by the production of adventitious roots, which are developmentally different from rhizo-morphic types. Based on the single character of the anatomy and development of the rooting structures, Selaginellites fraipontii is mostly closely allied with the Isoetales. Although the morphology of the underground parts has been used to suggest homologies among lycopsid genera, it may more accurately reflect the ecological conditions of the plant. Detailed paleoecological information about the habitat and substrates of certain types of lycopsids is also contributing to a better understanding of the groups. Although many of the large arborescent lycopsids with stigmarian rooting structures are found in coal-swamp environments, some taxa with lobed bases have been recovered from rocks more indicative of levees, deltas, or sandy, lakeshore environments (Jennings et al., 1983). It has been suggested that the extinction of arborescent taxa with extensive stigmarian rooting systems may have come about through the loss of suitable swampy environments in the Late Pennsylvanian, whereas the smaller plants with cormose bases were perhaps better able to adapt as the swamp habitats shrank or disappeared. newly emerging habitats. We still lack information about the frequency with which reproductive units were produced in these plants. Some have suggested that a plant like Chaloneria produced sporangia in a seasonal manner. Other taxa, like Lepidophloios, may have been monocarpic and coexisted with species of Diaphorodendron , which produced propagules over an extended period of time (DiMichele, 1981). Continued specialization in reproductive strategies of the arborescent lycopsids culminated in the production of propagules, like Lepidocarpon, with a single large megaspore that included extensive food reserves. This development would have increased the ability of the plant to delay germination until the optimal environmental conditions occurred. Most agree that the lycopsids had their origin within the zosterophyll complex, and it is within this group, as well as in the Drepanophycales, that stages in the evolution of the microphyll can be found. The origin and subsequent evolution of major lycopsid families or orders continue to remain less resolved. The fossil record of the group during the Paleozoic is extensive and, as our knowledge of additional plants and their reproductive biology increases, traditional lineages are often difficult to separate because several taxa show unusual combinations of characters or characters that are shared with more than one group. By comparison, the systematics and diversity of lycopsids in the Mesozoic and Cenozoic are very poorly known even in instances in which reproductive organs have been discovered (e.g., Bustia; Grauvogel-Stamm, 1991) (FIG. 9.125) . The major tasks in understanding lycopsid biology and evolution in the future will be to better resolve character states in some of the poorly understood taxa and to continue to test phylogenetic hypotheses. This will require more than merely the manipulation of data sets based on existing specimens, but rather will require a new focus on the discovery of additional, more informative specimens. The desired result of additional field work is the establishment of more fossil exemplar taxa that can be incorporated into phylogenetic analyses that use both extant and fossil species (DiMichele and Bateman, 1996). The continuing challenge in understanding lycopsid evolution is to comprehend these plants as members of dynamic ecosystems through time (DiMichele et al., 2001b).